Mazda seems to have a real knack for making fun, tossable little cars that perform much better than you expect them to. Add to the mix that for 2018, the Mazda3 will come as both a sedan and five-door hatchback slathered in tech and safety goodies, and it’s not too much of a stretch to see them selling by the boatload. The 3 comes in a trio of trim levels: Sport, Touring, and Grand Touring, and all of them get a bewildering level of option packages that have been a frustrating Mazda trademark for decades now. No, you can’t get cruise control without opting for the “Heated Glove Box & Rear Seat Foot-Warmer package.” There always seems to be two or three things in any given package you don’t really want. The Sport trim level, the most basic, comes with cloth seating surfaces and a 2.0-liter SKYACTIV-G engine, putting out 155 horsepower. There’s a 7-inch infotainment screen with a Commander control knob. The Sport also gets Bluetooth phone and audio pairing, a one-touch driver’s power window, power mirrors, remote keyless entry, and push-button ignition. Not bad for the base trim level. 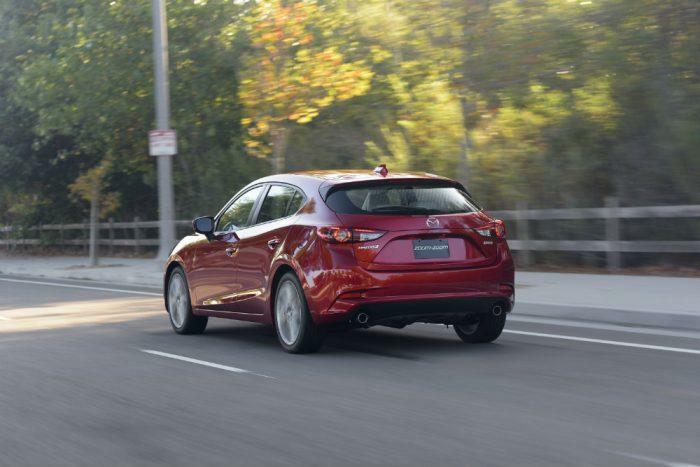 Mazda3 Sport sedan models have available 16-inch alloy wheels, Advanced Blind Spot Monitoring, Rear Cross-Traffic Alert, satin chrome interior trim, and power heated outside mirrors with integrated turn signals. The Mazda3 five-door models have 16-inch alloy wheels as standard. The Mazda3 Touring, the middle of the range, comes standard with a SKYACTIV-G 2.5-liter engine, cranking out 184 horsepower. The Touring comes with leatherette seating surfaces, heated front seats, Advanced Blind Spot Monitoring, Rear Cross-Traffic Alert, rain-sensing wipers, automatic on/off headlights, dual-zone automatic climate control, Mazda Advanced Keyless Entry, a six-way power driver’s seat, and a leather-wrapped steering wheel and shifter knob. Other niceties include a new dark silver alloy wheel color, standard illuminated vanity mirrors, and an overhead sunglasses holder. There’s a new Bose/Moonroof/Satellite package for the Touring that includes a nine-speaker premium audio system, SiriusXM radio with a four-month subscription, and a one-touch-open moonroof. 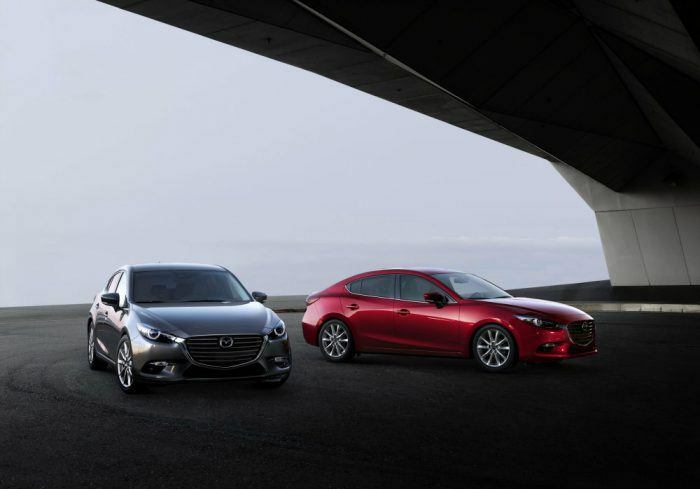 Up at the tippy-top of the Mazda3 lineup is the Grand Touring. Buy a Grand Touring Mazda3 and it comes standard with perforated black or parchment-colored leather seating surfaces and heated front seats. There’s a full-color Active Driving Display (heads-up) unit. LED fog lights, self-leveling bi-LED headlights, LED combination taillights, and LED daytime running lights are also standard. If you add the Premium Equipment Package, you get a pivoting Adaptive Front-Lighting System, a heated steering wheel, paddle shifters (automatic models), an auto-dimming interior mirror with Homelink, and navigation. Additional safety systems include High Beam Control, Lane Departure Warning, Lane Keep Assist, Mazda Radar Cruise Control, Smart Brake Support, and Traffic Sign Recognition. The 2018 Mazda3 is available with either a SKYACTIV-MT six-speed manual or a SKYACTIV-DRIVE six-speed automatic transmission, in either the sedan or five-door body style, and across all three trim levels. All Mazda3 models get something called G-Vectoring Control, which is, unsurprisingly, a Mazda-exclusive. G-Vectoring Control uses the engine to put a small amount of weight on the front tires to make steering inputs more surefooted, giving drivers more peace of mind while improving stability. Mazda doesn’t say much more, but the engineering is interesting nonetheless. Is the Mazda3 better than the Honda Accord or others in the segment? Ultimately, that will be up to individual buyers to decide, but personally, I wouldn’t count the Mazda3 out. At the end of December, we took the 2017 model for a drive and really liked it. Expect the 2018 Mazda3 to be in dealers nationwide by the end of August. 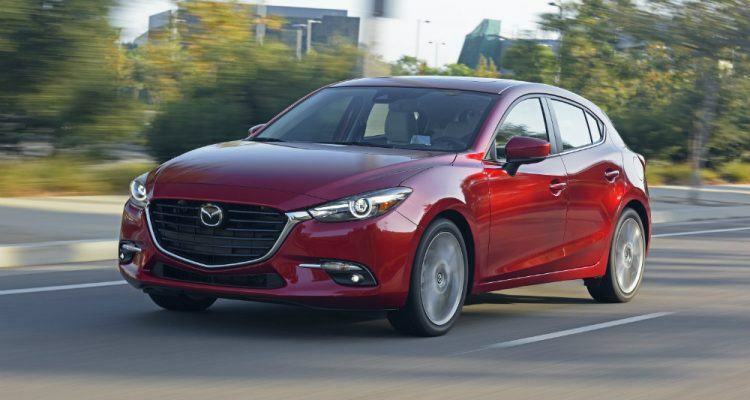 1 Comment on "2018 Mazda3 Trim Levels Broken Down"